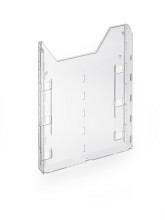 Single literature holder for presenting 1/3 A4 or A6 format information up to 210x116 mm in size. 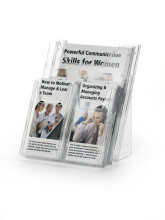 Set of three literature holders for displaying and presenting A4 format information (311x240 mm). 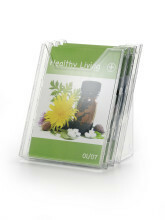 Literature holder for presenting and displaying information in A4 landscape format. 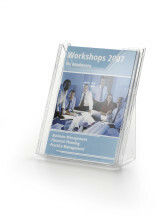 Can be used as a table stand or as a wall-mounted leaflet holder. 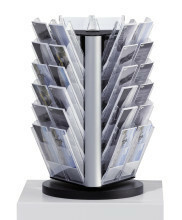 Set of five literature holders for displaying and presenting A4 format information (311x240 mm). 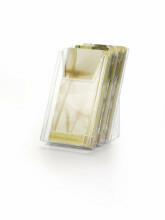 Literature holder set for A4 format (up to 311x240 mm) and 1/3 A4 or A6 format (up to 210x116 mm) information. 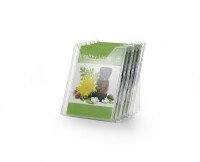 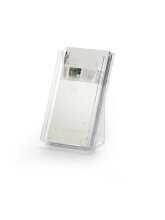 Single literature holder for displaying and presenting A4 format information (311x240 mm).